Zesty Chicken Thighs | Time to Cook! 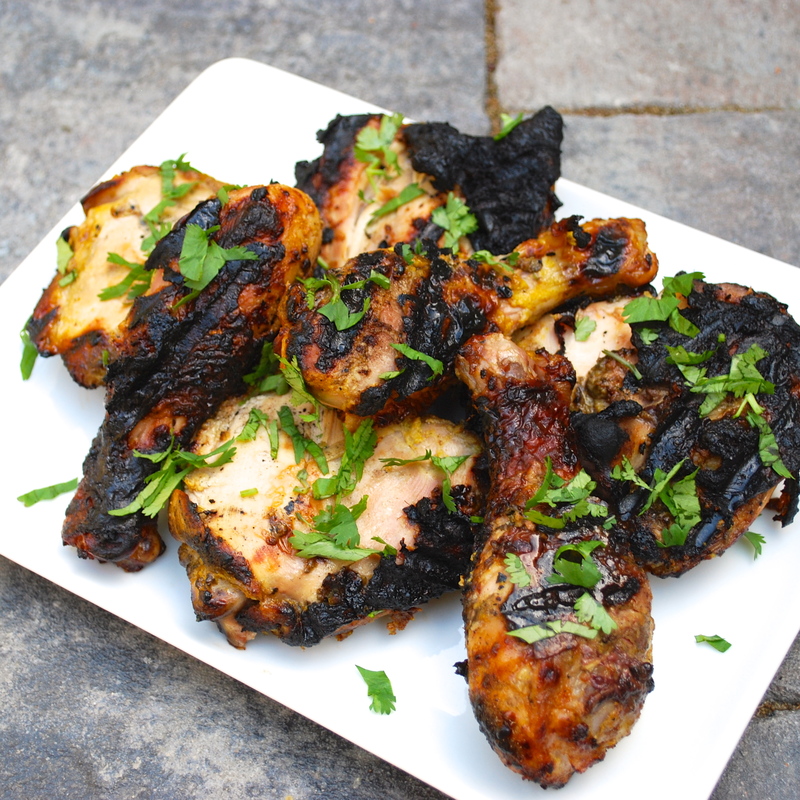 This is one of my ‘go-to’ grilled chicken marinades – very flavorful, fresh and healthy. I do think marinating the chicken overnight makes a big difference (and makes for one less thing to do the day of!) I whiz up my marinade, toss with my chicken pieces in a bowl, and store in Ziplock bags in the fridge overnight. Let sit on the counter 15-30 minutes prior to grilling. Recipe is easy to double if you’re having friends over. Make ahead: Prepare marinade 1-2 days before adding the chicken. Fit food-processor with steel blade attachment. With motor running, drop garlic cloves one at a time through feed tube and process until finely chopped. Remove lid and add yogurt, ginger, honey, lime juice, curry powder and salt. Process until smooth. Place chicken thighs and/or drumsticks in a large bowl and toss with marinade. Pour everything into a resealable plastic bag and seal. Allow the chicken to marinate in the refrigerator a minimum of 4 hours or up to 1 day for maximum flavor. Oil grill rack and pre-heat grill to medium heat (375 degrees). Remove the chicken from the marinade and place on the grill and cook without turning for 10 minutes. Turn chicken over with a thin flexible spatula and continue grilling, turning and rotating occasionally, until an instant-read thermometer inserted into the thickest part of the meat (without touching the bone) registers 170-180 degrees F, 20 to 25 minutes longer. Note the chicken may stick to the grill slightly. Serve hot or cold garnished with cilantro.